October 12, 2012. 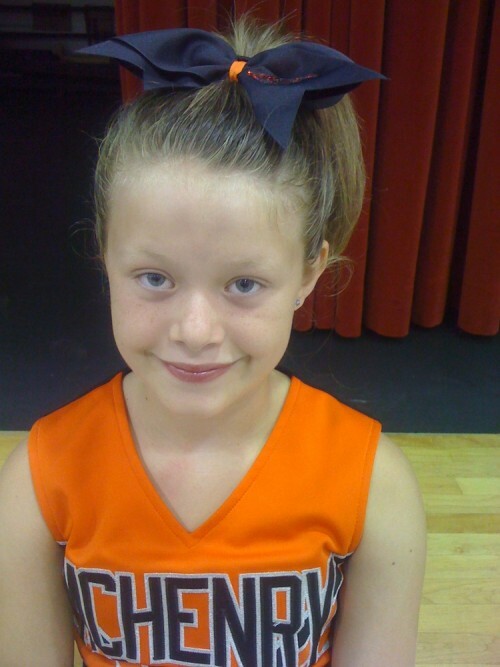 This is the day that my now twelve year old daughter, Maya Elisabeth, was diagnosed with cancer. High Risk Pre-B Cell Acute Lymphoblastic Leukemia to be exact. I felt as though the world had stopped turning. My sweet, active, social butterfly of a girl had turned into a shadow of herself seemingly overnight and the beast of cancer had entered my family’s life. No one can prepare you for this nightmare. Most of us never believe or understand that it can happen to absolutely anyone, until it does and it happens to your child. My daughter was living the life of a sixth grader. She was loving school, spending time with her friends, joining school activities and participating in volleyball and pommies. Her carefree existence stopped abruptly, and whether or not it will ever fully return is not a question I can answer. Life as you know it comes to screeching halt with a diagnosis of cancer. You and your family are thrust into a world of new vocabulary, new people and places, vast amounts of information and endless worries that are unfamiliar to you. Over the last ten months, I have often looked around and thought to myself that I just don’t recognize the life that I am living. And I had no idea that there was so much waiting to be done in my lifetime. This entire journey began for us with blood test results that we waited 18 hours for. I somehow knew in my gut what that phone conversation with the doctor would be, but even looking back now, it all still seems so unreal to me. Leukemia is aggressive and they begin treating it immediately, but it is an extremely long process with specifics that you cannot imagine. Over the course of the last ten months, we have watched Maya go through unimaginable experiences that no child should have to experience. Her bravery and ability to find the good has been astounding. We have spent countless hours waiting for results from blood tests, from spinal taps, and from bone marrow aspirations. I cannot begin to describe to you the special kind of hell that waiting for results that will tell you if it is likely that your child will live or die provides. We have had five such occasions to deal with the intense hours between a procedure and learning the outcome. Cleaning and listening to my child quote inappropriate lines from a popular Youtube video through belly-laughs are my top picks for ways to pass the time. I will always be tremendously thankful for everyone who tried to make those hours easier on us, as well as for Maya’s oncologist who fast-tracked the pathology results from her last bone marrow aspiration when we finally had something to celebrate. When Maya’s chemotherapy treatments began, I spent a lot of time waiting and watching for side effects to start. The doctors and nurses can give you an idea of what to expect, but we quickly found that truly every child reacts differently and there are many little quirks and unexpected “surprises” in every new phase of treatment. The first month of extremely intense treatment, we spent a lot of time at home, each of us just trying to get through the day the best we could. At some point, my initial state of shock wore off and I began my quest to interrupt the waiting by helping Maya continue to living life. It became clear to me that although she has cancer, this is still her life and she deserves to live it and live it fully. So although there are still all kinds of waiting–for fevers, for anti-nausea drugs to kick in, for mouth sores to erupt and then to go away, for her hair to fall out and then for it to grow back, for the next phase of treatment to begin, and for traffic every time we drive into Chicago for treatment–at least we are doing something to fill that time meaningfully and with so many loved ones joining us along the way. The waiting is the hardest part. 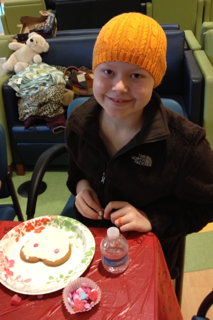 Maya waiting in clinic to see her doctors, passing the time with some treats to decorate. Maya has done a lot of living in the last ten months. She has done more living in between her treatments than any of us would have believed possible. Some of it is the life she would have lived without cancer like going to school, hanging out with her friends, taking trips to Door County and dancing. Some of it is the life that she is living because she has cancer, like speaking on Fox Chicago news about her diagnosis, raising awareness and money for St. Baldrick’s, supporting Cal’s Angel’s wish organization, attending a week at camp for children with cancer, spending tons of time in Chicago and making a new close friend with brain cancer. Either way, we have embraced it all and we are busy creating memories and enjoying life together instead of sitting around and waiting. Maya has developed a tremendous sense of empathy for other children and families going through the nightmare of cancer, even while she is still enduring it herself. She is often more worried about how we are doing than she is about herself. She has taught not just our family, but our friends and our community many valuable lessons about the precious nature of life. We are so very proud of her. We have found that not only does the world keep turning when a child you love has cancer, but life continues in a way in which you feel the passing of every minute. You recognize that how you choose to spend each of those minutes and who you choose to spend each of those minutes with matters more than anything. Maya is doing well currently, but relapse is always an unspoken fear and something we are waiting on. We are also waiting for the day that treatment is over and for the day that we can breathe a little easier because enough years have passed to declare our girl “cured.” Raising awareness for the lack of funding for pediatric cancer research has become something I am very passionate about. No child and no family should have to experience this. It is a long road with no guarantees and because of that, or maybe in spite of that, we will continue to live our lives with purpose, with joy and with hope every single day, no matter what we are waiting for. 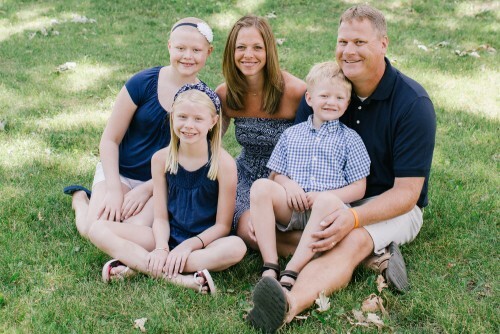 Maya’s family supports three different charities that have helped them during her treatment. One is Cal‘s All Star Angel Foundation (do you remember reading Cal’s Story earlier this month? ), another is St. Baldrick’s, the number one private funder of pediatric cancer research in America, and finally, One Step Camp for children with cancer. If you’re looking for all of the posts in the Childhood Cancer Stories: The September Series, you can find them catalogued HERE. If you don’t want to miss a single child’s story, you can subscribe to my blog. Please and thank you!